Dlala Nje founders Nickolaus Bauer and Michal Luptak at Ponte City in Johannesburg. We are the highest rated tour operator on TripAdvisor within the Johannesburg inner city. 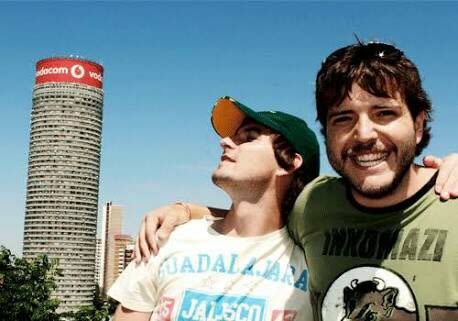 Nickolaus Bauer and Michal Luptak founded Dlala Nje ("just play" in isiZulu), an inner city tour operator with a twist, in October 2012. Dlala Nje aims to challenge perceptions about Johannesburg’s inner city, and to create opportunities in it. It runs what they call “inner-city immersions and experiences” in some of downtown Joburg’s most misunderstood areas. It also built and operates a community centre providing a safe learning environment for children. For many years Bauer lived in a luxurious, 120m2 two-bedroom apartment on the 51st floor of Ponte City – the iconic (some would say notorious) cylindrical skyscraper on the edge of Hillbrow. The Money Show’s Bruce Whitfield interviewed Bauer and Luptak for his weekly “The Science Of” feature. I live half a block away from the Telkom tower. Hillbrow is an example of the magnitude of opportunity that the City of Gold has to offer. The normality of Hillbrow has been forgotten. The Money Show's Bruce Whitfield interviews Jonathan Liebmann, the man behind Maboneng’s dramatic transformation.